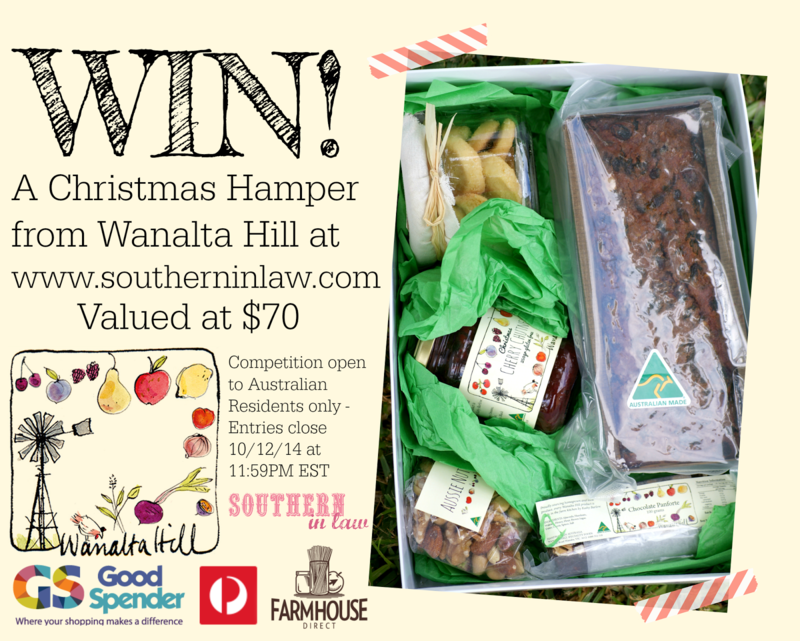 Southern In Law: WIN: A Christmas Hamper from Wanalta Hill Farm - and how YOU can support local producers this Christmas! WIN: A Christmas Hamper from Wanalta Hill Farm - and how YOU can support local producers this Christmas! Christmas is fast approaching and this year, Australia post is encouraging shoppers to support local businesses. But we're not talking about the local department store chain here - Australia Post has made it easy for everyone to support hardworking farmers, artisans and community minded social enterprises by putting their money where their heart is. Where Your Heart Is is a brand new online marketplace that links Good Spender and Farmhouse Direct to allow us to buy directly from these local producers. The website has a huge range of produce, homewares and gifts that directly benefit Australian families and communities in need so that you can give a gift to someone you love that also gives back to others. Where Your Heart Is makes Christmas shopping a breeze because you can order from the comfort of your own home - and even have gifts delivered straight to the lucky recipient! And for my fellow bargainistas? Any purchases made on the website between the 18th and 19th of November will have free shipping! I don't know about you, but that's always a drawcard for me and we're already planning on making some orders for some lovely friends of ours. But because we absolutely love this initiative - we wanted to share a Christmas Hamper with you! 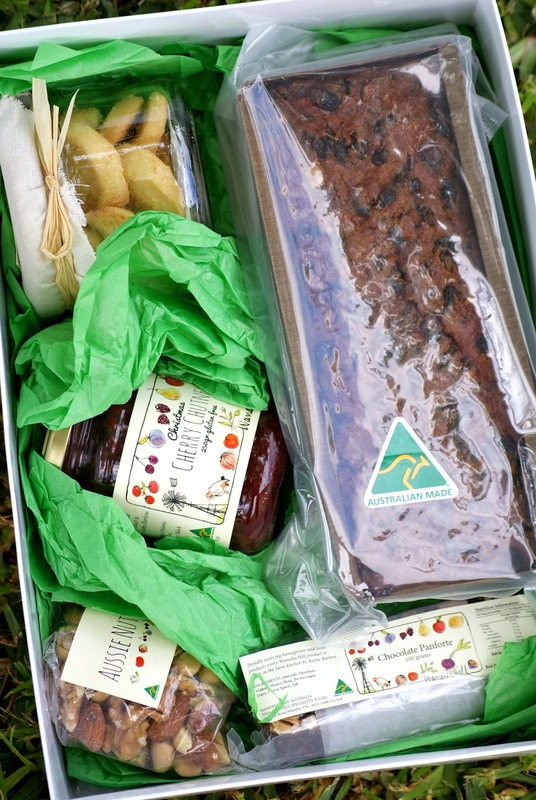 We have 1x Wanalta Hill Christmas Hamper to giveaway which contains homemade shortbread, fruit cake, Christmas chutney, chocolate panforte and an addictive Aussie nut mix. Wanalta Hill's Kathy Barlow cooks up delicious festive treats using premium Australian ingredients at her farm in Wanalta, North Central Victoria. Each and every item from Kathy's hamper was given major approval from the SIL Fam (and I was seriously wishing they were gluten free & Kristy friendly - but they do have gluten free options!!) and it really does feel like the perfect Christmas gift - made with love and no added nasties! Leave a comment at the bottom of this post letting me know what your favourite Christmas treat is! Hint: If you don't have a Disqus account, simply enter your name and email address (so we can contact you if you win) and hit "I'd rather post as a guest"
Extra Entry: Like us on FacebookAnd leave a comment by clicking "reply" below your original comment so we know it's you! And leave a comment by clicking "reply" below your original comment so we know it's you! Entries open to Australian Residents until time of competition's end (11:59PM EST December 10th, 2014). The winner will be contacted by email. Should the winner not respond within 2 weeks (14 days), an alternate winner will be chosen and the process will repeat if needed until a response is received. Yum! A Christmas Classic! Your entry is in our system, good luck! You are so right! Your entry is in our system, good luck! Traditional Christmas Pudding, set alight, with custard. Delicious. One of our Christmas faves! Your entry is in our system, good luck! Christmas Ham - I love it, can't get enough of it and sad when its gone. Christmas Ham has to be an Aussie fave! Your entry is in our system, good luck! I love Christmas mince pies they are so nice to enjoy with a cuppa and my feet up. Brandy snap baskets filled with fresh fruit of the season and whipped cream! Liked on Facebook, Twitter and Instagram - Merry Christmas! Sounds like the perfect way to relax! Your entry is in our system, good luck! Yum! Sounds amazing, Nadine! Your entry is in our system, good luck! Mmmm I can never get enough cherries! Your entry is in our system, good luck! Yum! Sounds incredible! Your entry is in our system, good luck! Ooh an Aussie classic! Your entry is in our system, good luck! Munching chocolate Santas for breakfast. And my mum's stuffing in the turkey - so delicious warmed with gravy on Boxing Day! Liking and loving on FB! Love a selection of bbq seafood at christmas and fresh fruit on an aussie pav. Christmas is the perfect excuse to eat chocolate for brekky! ;) Your entry is in our system, good luck! Sounds amazing, Sharon! Your entry is in our system, good luck! Every year without fail my mum cooks the most decadent Christmas pudding. Atopped with homemade brandy custard sauce and a raspberry coulee accompaniment. It was my dad's absolute favourite. Since his passing we never fail to celebrate his life by enjoying his most desired Christmas treat, with a raised glass and a glint of tears in our eyes. I love White Christmas! It's sweet, delicious and the cherries provide a pretty pop of colour against the North Pole white chocolate confection. Very festive! Pavlova, it is the only day of the year I allow myself to eat it. Covered in fresh strawberries, blueberries, raspberries and topped with some maraschino cherries and a drizzle or three of blue curacao.....I can hardly wait! I even leave some for Santa with his milk!! Gingerbread. Every year we make gingerbread houses that the children decorate them on Christmas Eve as gifts for friends and family. Yum. And fun too. I love making dark chocolate salted almond toffee, molasses cookies fudge and crinkles cookies. I followed you on Facebook and Twitter. What a sweet tradition! Your entry is in our system, good luck! You are definitely right, Dianne! Your entry is in our system, good luck! Sounds delish! Your entry is in our system, good luck! Shortbread is definitely one of our faves! Your entry is in our system, good luck! Sounds amazing, Kelly! Your entry is in our system, good luck! What an awesome twist! Your entry is in our system, good luck! Ooh, now that's the perfect summer twist on a classic! Your entry is in our system, good luck! Christmas pudding, so delicious and comforting to eat for Christmas! Definitely a Christmas fave! Your entry is in our system, good luck! Mmmm, yum! Your entry is in our system, good luck! My favourite Christmas treat would have to be my mother's Port Wine Trifle. A family tradition that is hard to beat. My favourite Christmas treat is Christmas Pudding Ice Cream. It's the delicious taste of Christmas pudding, but icy cold for a hot Aussie Christmas. I, too, love a Christmas pudding ice cream - just delicious. Sadly my Mum rarely makes it now :( & that was part of the joy of it! Sounds perfect for an Aussie summer, Merryl! Your entry is in our system, good luck! Sounds amazing, Nicola - perhaps you need to give her a hand this year and keep the tradition alive! Your entry is in our system, good luck! Yum! What a treat, Tiarne! Your entry is in our system, good luck! Home made shortbread pastry mince pies... You gently prise off the lid and fill with lightly sweetened whipped cream. Bliss!! Definitely a winner, Kaye! Your entry is in our system, good luck! Yum! Sounds amazing, Leanne! Your entry is in our system, good luck! I love to make Brandy Snap baskets and fill them with whatever fresh fruit is in season and drizzle fresh cream over the top! Scrumptious! I love a wine trifle at Christmas, it looks so pretty and tastes divine. My favourite Christmas treat is a glass of my father-in-law's homemade Gluhwein (Mulled Wine). Beautiful spicy citrus and cinnamon aromas that will put you in the holiday spirit! My mom makes a large breakfast every year, and I love the potatoes she serves Christmas morning. Pigs in blankets! Sausages wrapped in bacon! Caramel pie- a tradition in our family. Yummo! My fave Christmas treat is the one day of the year I over indulge.......in everything !!!! I love Pumpkin Pie with whipped cream on top! It reminds me of home back in Arizona and Christmases spent at my grandmother's house. Lobster with garlic butter and chopped parsley - we do it every year and it's scrumdillyumyum! My Favourite Christmas treat is the Chocolate Panforte, i love how it has many ingredients mixed in it, Delicious. Morton Bay Bugs - eat them once a year.... Adore!!! By having Turkey leftovers for a few nights! I just adore devouring fruit mince pies at christmas time! We always have boxes of Roses (chocolates) that we devour on Christmas, yummo! Oh and cherries!